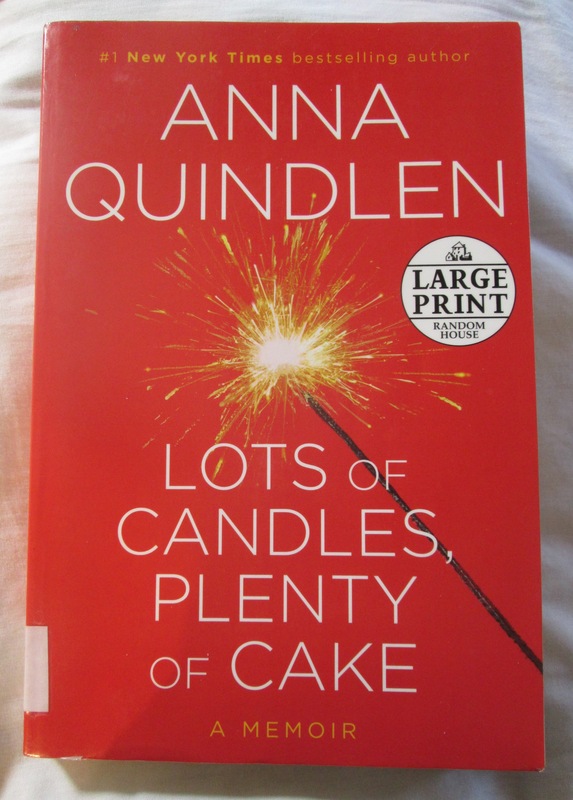 One of the books I brought home from the Biblioteca here in San Miguel de Allende recently to tide me over the holidays (as I mentioned in my previous WOW, “Frugal Chariots,” posted Dec. 22) was Anna Quindlen’s memoir, Lots of Candles, Plenty of Cake. I chose it, not because I planned to review it, but because I remembered reading Quindlen’s regular column in The New York Times when I lived in New York twenty-plus years ago and loving it. I loved her take on things then, her wit, her smarts, her voice. I wanted to spend time with her over Christmas and hear her voice again. I wasn’t disappointed. She was great company. For those who might need a refresher, here is just a short summation of Anna Quindlen’s impressive accomplishments: She’s a novelist and journalist whose work has appeared on fiction, nonfiction, and self-help bestseller lists. Her book A Short Guide to a Happy Life has sold more than a million copies. While a columnist at The New York Times, she won the Pulitzer Prize for commentary and published two collections of her columns: Living Out Loud and Thinking Out Loud. Her Newsweek columns were collected in the book Loud and Clear. She is the author of nine novels, two of which have been adapted into movies. Despite all this remarkableness, she comes across in Lots of Candles, Plenty of Cake as astoundingly down to earth and approachable, like a genuinely friendly neighbor. I felt as I read it that she enjoyed coming over to my apartment for coffee, so we could chat across the kitchen table, mature woman to mature woman, whiling away the afternoon. It’s that VOICE that came through the pages to me, as if I were listening to an audiobook in which she herself had made the recording. 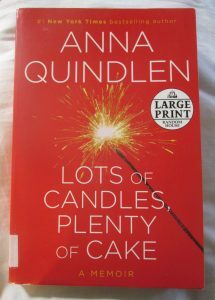 In this book, Quindlen writes about looking back – and forward – from the perspective of her early sixties, considering all the things that matter, especially to women: friends, family, faith, loss, mothers and motherhood, wisdom (and much more). Although I couldn’t relate to every aspect of her life (I’m not, for example, Italian-Irish American, Catholic, happily married to the same college sweetheart for forty-plus years, the mother of three grown children, the owner of an apartment in NYC and a house in the country, and so on, and so on), there was plenty in what she shared that resonated with me. Anna Quindlen, Wikipedia informed me, was born on July 8, 1953, which makes her eight years younger than I. Still young, I think. Only in her mid-sixties. Which may, in part at least, account for the rosy glow she tends to put on aging. I wonder, though, if she were to write a sequel to this memoir in about ten years, how different would it be? Would she admit to slow physical decline, more heart-rending losses, greater unforeseen challenges, all the new adjustments and realignments? Well, I’ll have to wait and see. In the meantime, maybe I could suggest a title for that sequel: Even More Candles, Hold the Cake.